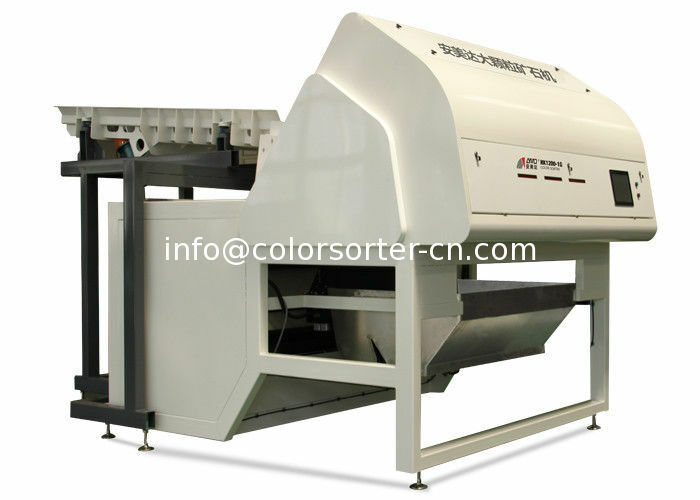 Zhongke has been developing and manufacturing optical sorting machinery for a wide range tasks.Zhongke color sorters are among the highest-capacity color sorters worldwide.The various mineral sorters separate materials ranging from the size of a pin head to the size of a soccer ball. For the different sizes and characteristics of material particle, Zhongke ore color sorters use the solenoid valve of different sizes. 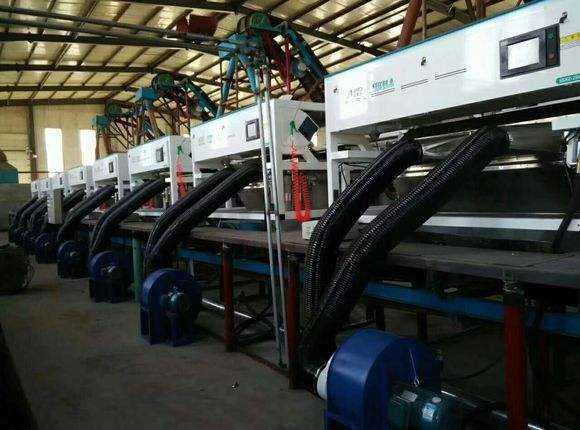 In recent years, Zhongke sorting systems have proven their effectiveness in sorting minerals in many varying applications. We sort raw materials using color,brightness and shape and cost effectively replace size reduction and hand sorting as means of upgrading run of mine product. The better utilization of the raw material leads to increased product quality and reduced treatment costs achieving economic and ecological advantages. From the rice experience in the field,Zhongke has evolved an entire family of reliable sorters operating in the particle range of 1-250 mm with throughput rates of 5-150 t/h. Sensor-based ore sorting rejects waste rocks from run-of-mine ore. This enables mining with a lower cutoff grade, which means beneficiation of more diluted ore with lower ore loss in mining. Sensor-based ore sorting reduces ore transportation costs per ton of produced metal when a sorting plant is installed at the mine. 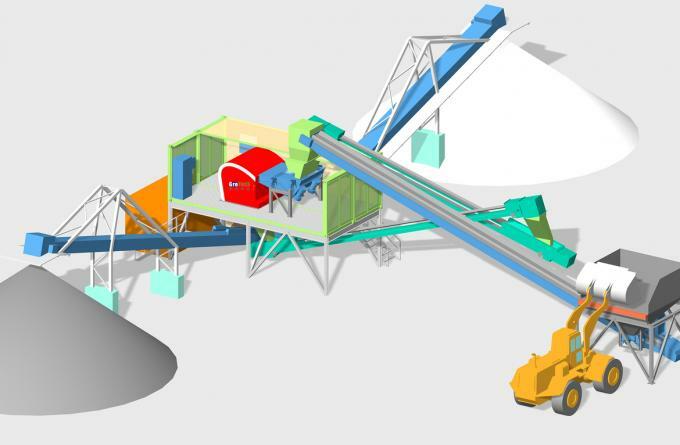 Our sorters allow you to separate ore types based on their characteristics. Treating different ores separately can increase recovery and concentrate grades. Boost concentrate production by replacing rejected waste with higher-grade feed ore to the mill. Using sensor-based ore sorting technology reduces your water consumption per ton of produced metal in concentrate. Rejecting waste from ore at an early stage in the processing circuit allows the mass of fie final tailing to be reduced, which in turn reduces the space required for tailing storage and the related costs per ton of produced metal in concentrate. Once separated, coarse waste can be sold as aggregate to local markets, offering an additional source of revenue. Particles are crushed and screened for applicable size,typically in the range 20–150 mm, with a maximum to minimum size ratio of 1:3. Individual particles need to be presented to the sensor system. Typically, this is done using vibrating feeders followed by a chute or fast-moving conveyor belt. • Reflection systems including technologies such as optical cameras that identify particles based on surface properties. 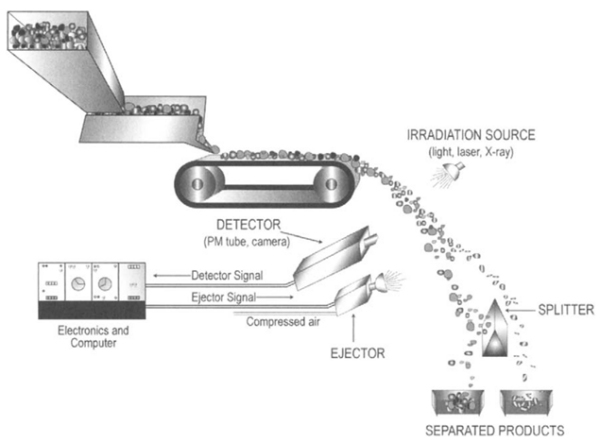 • Transmission systems such as X-ray transmission that detect particles based on density differences. The data received from the sensor system needs to be processed in real time. Data processing makes the“yes or no” ejection decision for each particle. After decision-making the particle to be separated is selectively ejected by air jets that push the particle out of the main stream.